This article is about the Egyptian diplomat. For his grandfather, the former Prime Minister of Egypt, see Boutros Ghali. Boutros Boutros-Ghali (/ˈbuːtrɒs ˈɡɑːli/; Coptic: Ⲡⲉⲧⲣⲟⲥ Ⲡⲉⲧⲣⲟⲥ-Ⲅⲁⲗⲓ, Arabic: بطرس بطرس غالي‎ Buṭrus Buṭrus Ghālī, Egyptian Arabic: [ˈbotɾos ˈɣæːli]; 14 November 1922 – 16 February 2016) was an Egyptian politician and diplomat who was the sixth Secretary-General of the United Nations (UN) from January 1992 to December 1996. An academic and former Vice Foreign Minister of Egypt, Boutros-Ghali oversaw the UN at a time when it dealt with several world crises, including the breakup of Yugoslavia and the Rwandan genocide. He was then the first Secretary-General of the Organisation internationale de la Francophonie from 16 November 1997 to 31 December 2002. Boutros Boutros-Ghali was born in Cairo, Egypt, on 14 November 1922 into a Coptic Christian family. His father Yusuf Butros Ghali was the son of Boutros Ghali Bey then Pasha (also his namesake), who was Prime Minister of Egypt from 1908 until he was assassinated in 1910. His mother Safela Mikhail Sharubim was daughter of Mikhail Sharubim (1861–1920), a prominent public servant and historian. Boutros-Ghali graduated from Cairo University in 1946. He received a PhD in international law from the University of Paris and diploma in international relations from the Sciences Po in 1949. During 1949–1979, he was appointed Professor of International Law and International Relations at Cairo University. He became President of the Centre of Political and Strategic Studies in 1975 and President of the African Society of Political Studies in 1980. He was a Fulbright Research Scholar at Columbia University from 1954 to 1955, Director of the Centre of Research of the Hague Academy of International Law from 1963 to 1964, and Visiting Professor at the Faculty of Law at Paris University from 1967 to 1968. In 1986 he received an honorary doctorate from the Faculty of Law at Uppsala University, Sweden. He was also the Honorary Rector of the Graduate Institute of Peace Studies, a branch of Kyunghee University Seoul. Boutros Boutros-Ghali's political career developed during the presidency of Anwar El Sadat. He was a member of the Central Committee of the Arab Socialist Union from 1974 to 1977. He served as Egypt's Minister of State for Foreign Affairs from 1977 until early 1991. He then became Deputy Minister for Foreign Affairs for several months before moving to the UN. As Minister of State for Foreign Affairs, he played a part in the peace agreements between President Sadat and Israeli Prime Minister Menachem Begin. According to investigative journalist Linda Melvern, Boutros-Ghali approved a secret $26 million arms sale to the government of Rwanda in 1990 when he was Foreign Minister, the weapons stockpiled by the Hutu regime as part of the fairly public, long-term preparations for the subsequent genocide. He was serving as UN Secretary-General when the killings occurred four years later. Boutros-Ghali ran for Secretary-General of the United Nations in the 1991 selection. The top post in the UN was opening up as Javier Pérez de Cuéllar of Peru reached the end of his second term, and Africa was next in the rotation. Boutros-Ghali tied Bernard Chidzero of Zimbabwe in the first two rounds of polling, edged ahead by one vote in round 3, and fell behind by one vote in round 4. After several countries withdrew their support for Chidzero, fed by fears that the United States was trying to eliminate both of the leading candidates, Boutros-Ghali won a clear victory in round 5. Boutros-Ghali's term in office remains controversial. In 1992, he submitted An Agenda for Peace, a suggestion for how the UN could respond to violent conflict. However, he was criticised for the UN's failure to act during the 1994 Rwandan Genocide, which officially left over one million people dead, and he appeared unable to muster support in the UN for intervention in the continuing Angolan Civil War. One of the hardest tasks during his term was dealing with the crisis of the Yugoslav Wars after the disintegration of the former Yugoslavia. His reputation became entangled in the larger controversies over the effectiveness of the UN and the role of the United States in the UN. Some Somalis believed he was responsible for an escalation of the Somalia crisis by undertaking a personal vendetta against Mohamed Farrah Aidid and his Habr Gidr clan, favouring their rivals, the Darod the clan of the former dictator Mohamed Siad Barre. It was believed that he demanded the 12 July 1993 US helicopter attack on a meeting of Habr Gidr clan leaders, who were meeting to discuss a peace initiative put forward by the leader of the UN Mission in Mogadishu, retired U.S. Admiral Jonathan Howe. It is generally believed that the majority of the clan elders were eager to arrange a peace and to rein in the provocative activities of their clan leader, Mohamed Farrah Aidid, but, after this attack on a peaceful meeting, the clan was resolved on fighting the Americans and the UN, leading to the Battle of Mogadishu on 3–4 October 1993. Boutros-Ghali ran unopposed for the customary second term in 1996, despite efforts by the United States to unseat him. U.S. ambassador Madeleine Albright asked Boutros-Ghali to resign and offered to establish a foundation for him to run, an offer that other Western diplomats called "ludicrous." American diplomatic pressure also had no effect, as other members of the Security Council remained unwavering in their support for Boutros-Ghali. He won 14 of the 15 votes in the Security Council, but the sole negative vote was a U.S. veto. After four deadlocked meetings of the Security Council, France offered a compromise in which Boutros-Ghali would be appointed to a short term of two years, but the United States rejected the French offer. Finally, Boutros-Ghali suspended his candidacy, becoming the only Secretary-General ever to be denied a second term by a veto. Boutros Boutros-Ghali's wife, Leia Maria Boutros-Ghali, née Leia Nadler, was raised in an Egyptian Jewish family in Alexandria and converted to Catholicism as a young woman. 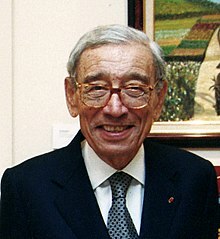 From 1997 to 2002, Boutros-Ghali was Secretary-General of La Francophonie, an organisation of French-speaking nations. From 2003 to 2006, he served as the chairman of the board of the South Centre, an intergovernmental research organisation of developing countries. Boutros-Ghali played a "significant role" in creating Egypt's National Council for Human Rights, and served as its president until 2012. Boutros-Ghali supported the Campaign for the Establishment of a United Nations Parliamentary Assembly and was one of the initial signatories of the Campaign's appeal in 2007. In a message to the Campaign, he stressed the necessity to establish democratic participation of citizens at the global level. From 2009–2015 he also participated as jury member for the Conflict Prevention Prize, awarded every year by the Fondation Chirac. Boutros-Ghali died aged 93 in a hospital in Cairo, after having been admitted for a broken pelvis or leg, on 16 February 2016. A military funeral was held for him with prayers led by Coptic Pope Tawadros II. He is buried at Petrine Church in Abbassia, Cairo. Honorary degree from Sciences Po , Russian Academy of Sciences , Catholic University of Leuven , Université Laval , Université de Moncton , Carleton University , Université du Québec à Chicoutimi , Charles III University of Madrid , University of Bucharest , Baku State University , Yerevan State University , University of Haifa , University of Vienna , University of Melbourne , Seoul National University , Waseda University , University of Bordeaux. ^ Reid, Donald M. (1982). "Political Assassination in Egypt, 1910–1954". The International Journal of African Historical Studies. 15 (4): 625–651. doi:10.2307/217848. JSTOR 217848. ^ a b Goshko, John M. (2016-02-16). "Boutros Boutros-Ghali, U.N. secretary general who clashed with U.S., dies at 93". The Washington Post. ISSN 0190-8286. Retrieved 2016-02-16. ^ "Honorary doctorates – Uppsala University, Sweden". www.uu.se (in Swedish). Retrieved 2018-03-17. ^ "Boutros Boutros-Ghali: The world is his oyster". Weekly Ahram. 18 January 2006. Archived from the original on 30 June 2012. Retrieved 8 June 2012. ^ Lewis, Paul (23 November 1991). "How U.N. Nominee Won: 4 Switched". The New York Times. ^ Bowden, Mark (1999). Black Hawk Down: A Story of Modern War. New York: New American Library. pp. 83–84. ISBN 0-451-20514-6. ^ Crossette, Barbara (5 December 1996). "U.N. Leader Halts Bid for New Term but Does Not Quit". The New York Times. ^ Goshko, John M. (19 November 1996). "U.S. Sides Against Second Term for U.N. Chief in Informal Vote". The Washington Post. ^ "At Home With: Boutros Boutros-Ghali". ^ "South Centre website". Southcentre.org. 8 June 2012. Retrieved 8 June 2012. ^ "Egypt: NCHR Mourns Death of Boutros Ghali". allAfrica. ^ "Boutros Boutros-Ghali: Make diplomacy, not war". Al Jazeera. ^ "Who's who in Egypt's reshuffled Human Rights Council". Ahram Online. ^ "MESSAGE FROM DR. BOUTROS BOUTROS GHALI" (PDF). International campaign for the establishment of a United Nations Parliamentary Assembly. ^ "The jury for the Conflict Prevention Prize awarded by the Fondation Chirac". Fondationchirac.eu. 30 May 2012. Retrieved 8 June 2012. ^ "Boutros Boutros-Ghali, former UN head, dies at 93". BBC News. Retrieved 2016-02-16. ^ "Boutros Boutros-Ghali: Make diplomacy, not war". www.aljazeera.com. Retrieved 2016-02-18. ^ "Former U.N. Secretary-General Boutros Boutros-Ghali dies - CNN.com". CNN. Retrieved 2016-02-18. ^ "Boutros Boutros-Ghali, Former U.N. Secretary General, Dies at 93". Retrieved 2018-03-17. ^ "Boutros-Ghali to be buried at family's Italian-style church – Egypt Independent". Egypt Independent. 2016-02-17. Retrieved 2018-03-17. Goldschmidt, Arthur (1993). "The Butrus Ghali Family". Journal of the American Research Center in Egypt. 30: 183–188. doi:10.2307/40000236. ISSN 0065-9991. JSTOR 40000236. (Subscription required (help)). Wikimedia Commons has media related to Boutros Boutros-Ghali. Kofi Atta Annan was a Ghanaian diplomat who served as the seventh Secretary-General of the United Nations from January 1997 to December 2006. 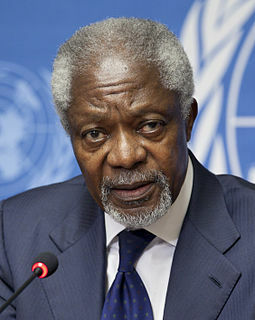 Annan and the UN were the co-recipients of the 2001 Nobel Peace Prize. He was the founder and chairman of the Kofi Annan Foundation, as well as chairman of The Elders, an international organization founded by Nelson Mandela. United Nations Security Council resolution 940, adopted on 31 July 1994, after recalling resolutions 841 (1993), 861 (1993), 862 (1993), 867 (1993), 873 (1993), 875 (1993), 905 (1994), 917 (1994) and 933 (1994), the Council permitted a United States-led force to restore President Jean-Bertrand Aristide and authorities of the Government of Haiti, and extended the mandate of the United Nations Mission in Haiti (UNMIH) for an additional six months. Boutros Ghali was the prime minister of Egypt from 1908 to 1910. Youssef Raouf Boutros-Ghali or "YBG" is an Egyptian economist who served in the government of Egypt as Minister of Finance from 2004 to 2011. He was succeeded by Samir Radwan on 31 January 2011. Sir Marrack Goulding KCMG was a British diplomat who served more than eleven years as Under-Secretary-General of the United Nations. Sylvana Foa is a former foreign correspondent and public affairs specialist who shattered glass ceilings within the media and the United Nations. She was the first woman to serve as foreign editor of a major international news organization, the first woman news director of an American television network and the first woman to serve as Spokesman for the Secretary General of the United Nations. United Nations Security Council resolution 846, adopted unanimously on 22 June 1993, after reaffirming Resolution 812 (1993) on the situation in Rwanda and noting a report by the Secretary-General Boutros Boutros-Ghali, the Council established the United Nations Observer Mission Uganda–Rwanda (UNOMUR) for an initial period of six months. United Nations Security Council resolution 918, adopted without a vote on 17 May 1994, after reaffirming all resolutions on the situation in Rwanda, particularly resolutions 872 (1993), 909 (1994) and 912 (1994), the Council expressed its alarm and condemnation at the continuing large-scale violence, and went on to impose an arms embargo on the country and authorised an expansion of the United Nations Assistance Mission for Rwanda (UNAMIR). United Nations Security Council resolution 965, adopted unanimously on 30 November 1994, after reaffirming all resolutions on the situation in Rwanda, particularly resolutions 872 (1993), 912 (1994), 918 (1994), 925 (1994) and 955 (1994), the Council extended the mandate of the United Nations Assistance Mission for Rwanda (UNAMIR) until 9 June 1995 and expanded its operations. United Nations Security Council resolution 1029, adopted unanimously on 12 December 1995, after recalling previous resolutions on Rwanda, including Resolution 872 (1993), Resolution 912 (1994), Resolution 918 (1994), Resolution 925 (1994), Resolution 955 (1994), Resolution 965 (1994), Resolution 978 (1995) and Resolution 997 (1995), the Council extended the mandate of the United Nations Assistance Mission for Rwanda (UNAMIR) for a final time, ending 8 March 1996, and adjusted its mandate. United Nations Security Council resolution 1050, adopted unanimously on 8 March 1996, after recalling all previous resolutions on Rwanda, the Council discussed arrangements for the withdrawal of the United Nations Assistance Mission for Rwanda (UNAMIR). United Nations Security Council resolution 1078, adopted unanimously on 9 November 1996, after expressing concern at the situation in the African Great Lakes region, the Council discussed proposals for a regional conference on security and a multinational humanitarian force in eastern Zaire. Mohamed Kamel Amr is an Egyptian diplomat who served as Egypt's minister of foreign affairs from 2011 to 2013. He resigned from office on 30 June 2013. St. Peter and St. Paul's Church, commonly known as El-Botroseya and also known as the Petrine Church, is a small Coptic church located in the vicinity of Saint Mark's Coptic Orthodox Cathedral, the seat of the Pope of the Coptic Orthodox Church of Alexandria, in Cairo's Abbassia district. It was built in 1911 over Egyptian prime minister Boutros Ghali's tomb. A United Nations Secretary-General selection was held in 1996 at the end of Boutros Boutros-Ghali's first term. Boutros-Ghali ran unopposed for a second term and received the support of 14 of the 15 members of the United Nations Security Council. However, the United States vetoed his re-selection and eventually forced him to withdraw his candidacy. 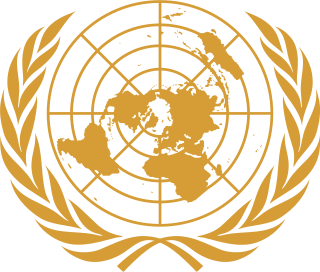 A United Nations Secretary-General selection was held in 1991 to replace Javier Pérez de Cuéllar, whose second term would end on 31 December 1991. Boutros Boutros-Ghali of Egypt was selected for a term ending on 31 December 1996, becoming the first Secretary-General from Africa.